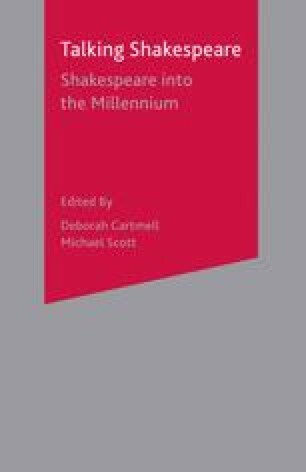 Polonius has dabbled in the dramatic arts, and his commendation to Hamlet of the approaching Players not only notes their generic scope but also their professional competence, as the ‘only men’ both ‘for the law of writ, and the liberty’ (II.ii.397–8). This contrast, between literal adherence and ad hoc freedoms, is one that Hamlet apparently understands only too well. His advice to the First Player combines a great suspicion of actorly brio with the hope that a performance will not be ‘too tame’, the adjudication lying with one’s ‘discretion’, where the ‘action’ is suited to the ‘word’, and, less predictably, vice versa (III.ii.16–18). For all the ‘modesty of nature’ (III.ii.19) that might be the guiding principle, the ‘word’ may still be suited to the ‘action’. On the one hand, one needs to temper the egoistic display of those ‘clowns’ that tamper with what ‘is set down for them’ (III.ii.39), while, on the other, one needs to perform. The text of The Murder of Gonzago can only exist for the on-stage courtly audience as a pretext for Hamlet’s precise design, realized in one of its hearer’s specific reactions to a carefully calculated theatrical statement. In this instance, the ‘law of writ’ is interpreted precisely.